Antibiotics are chemical substances that can inhibit the growth of, and even destroy, harmful microorganisms. They are derived from special microorganisms or other living systems, and are produced on an industrial scale using a fermentation process. Although the principles of antibiotic action were not discovered until the twentieth century, the first known use of antibiotics was by the Chinese over 2,500 years ago. Today, over 10,000 antibiotic substances have been reported. Currently, antibiotics represent a multibillion dollar industry that continues to grow each year. Antibiotics are used in many forms—each of which imposes somewhat different manufacturing requirements. For bacterial infections on the skin surface, eye, or ear, an antibiotic may be applied as an ointment or cream. If the infection is internal, the antibiotic can be swallowed or injected directly into the body. In these cases, the antibiotic is delivered throughout the body by absorption into the bloodstream. Antibiotics differ chemically so it is under-standable that they also differ in the types of infections they cure and the ways in which they cure them. Certain antibiotics destroy bacteria by affecting the structure of their cells. This can occur in one of two ways. First, the antibiotic can weaken the cell walls of the infectious bacteria, which causes them to burst. Second, antibiotics can cause the contents of the bacterial cells to leak out by damaging the cell membranes. Another way in which antibiotics function is by interfering with the bacteria's metabolism. Some antibiotics such as tetracycline and erythromycin interfere with protein synthesis. Antibiotics like rifampin inhibit nucleic acid biosynthesis. Still other antibiotics, such as sulfonamide or trimethoprim have a general blocking effect on cell metabolism. The commercial development of an antibiotic is a long and costly proposal. It begins with basic research designed to identify organisms, which produce antibiotic compounds. During this phase, thousands of species are screened for any sign of antibacterial action. When one is found, the species is tested against a variety of known infectious bacteria. If the results are promising, the organism is grown on a large scale so the compound responsible for the antibiotic effect can be isolated. This is a complex procedure because thousands of antibiotic materials have already been discovered. Often, scientists find that their new antibiotics are not unique. If the material passes this phase, further testing can be done. This typically involves clinical testing to prove that the antibiotic works in animals and humans and is not harmful. If these tests are passed, the Food and Drug Administration (FDA) must then approve the antibiotic as a new drug. This whole process can take many years. The large-scale production of an antibiotic depends on a fermentation process. During fermentation, large amounts of the antibiotic-producing organism are grown. 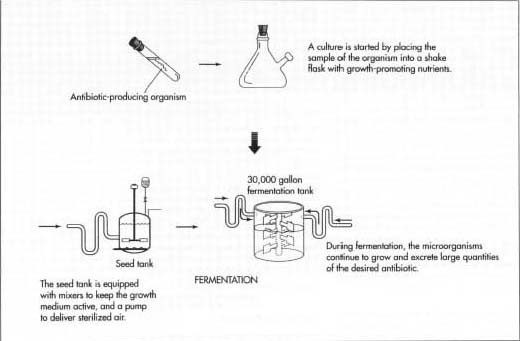 During fermentation, the organisms produce the antibiotic material, which can then be isolated for use as a drug. For a new antibiotic to be economically feasible, manufacturers must be able to get a high yield of drug from the fermentation process, and be able to easily isolate it. Extensive research is usually required before a new antibiotic can be commercially scaled up. While our scientific knowledge of antibiotics has only recently been developed, the practical application of antibiotics has existed for centuries. The first known use was by the Chinese about 2,500 years ago. During this time, they discovered that applying the moldy curd of soybeans to infections had certain therapeutic benefits. It was so effective that it became a standard treatment. Evidence suggests that other cultures used antibiotic-type substances as therapeutic agents. The Sudanese-Nubian civilization used a type of tetracycline antibiotic as early as 350 A.D. In Europe during the Middle Ages, crude plant extracts and cheese curds were also used to fight infection. Although these cultures used antibiotics, the general principles of antibiotic action were not understood until the twentieth century. The development of modern antibiotics depended on a few key individuals who demonstrated to the world that materials derived from microorganisms could be used to cure infectious diseases. One of the first pioneers in this field was Louis Pasteur. In 1877, he and an associate discovered that the growth of disease-causing anthrax bacteria could be inhibited by a saprophytic bacteria. They showed that large amounts of anthrax bacilli could be given to animals with no adverse affects as long as the saprophytic bacilli were also given. Over the next few years, other observations supported the fact that some bacterially derived materials could prevent the growth of disease-causing bacteria. In 1928, Alexander Fleming made one of the most important contributions to the field of antibiotics. In an experiment, he found that a strain of green Penicillium mold inhibited the growth of bacteria on an agar plate. This led to the development of the first modern era antibiotic, penicillin. A few years later in 1932, a paper was published which suggested a method for treating infected wounds using a penicillin preparation. Although these early samples of penicillin were functional, they were not reliable and further refinements were needed. These improvements came in the early 1940s when Howard Florey and associates discovered a new strain of Penicillium, which produced high yields of penicillin. This allowed large-scale production of penicillin, which helped launch the modern antibiotics industry. After the discovery of penicillin, other antibiotics were sought. In 1939, work began on the isolation of potential antibiotic products from the soil bacteria streptomyces. It was around this time that the term antibiotic was introduced. Selman Waxman and associates discovered streptomycin in 1944. Subsequent studies resulted in the discovery of a host of new, different antibiotics including actinomycin, streptothricin, and neomycin all produced by Streptomyces. Other antibiotics that have been discovered since include bacitracin, polymyxin, viomycin, chloramphenicol and tetracyclines. Since the 1970s, most new antibiotics have been synthetic modifications of naturally occurring antibiotics. The compounds that make the fermentation broth are the primary raw materials required for antibiotic production. This broth is an aqueous solution made up of all of the ingredients necessary for the proliferation of the microorganisms. Typically, it contains a carbon source like molasses, or soy meal, both of which are made up of lactose and glucose sugars. These materials are needed as a food source for the organisms. Nitrogen is another necessary compound in the metabolic cycles of the organisms. For this reason, an ammonia salt is typically used. Additionally, trace elements needed for the proper growth of the antibiotic-producing organisms are included. These are components such as phosphorus, sulfur, magnesium, zinc, iron, and copper introduced through water soluble salts. To prevent foaming during fermentation, anti-foaming agents such as lard oil, octadecanol, and silicones are used. Although most antibiotics occur in nature, they are not normally available in the quantities necessary for large-scale production. For this reason, a fermentation process was developed. It involves isolating a desired microorganism, fueling growth of the culture and refining and isolating the final antibiotic product. It is important that sterile conditions be maintained throughout the manufacturing process, because contamination by foreign microbes will ruin the fermentation. 1 Before fermentation can begin, the desired antibiotic-producing organism must be isolated and its numbers must be increased by many times. To do this, a starter culture from a sample of previously isolated, cold-stored organisms is created in the lab. In order to grow the initial culture, a sample of the organism is transferred to an agar-containing plate. The initial culture is then put into shake flasks along with food and other nutrients necessary for growth. This creates a suspension, which can be transferred to seed tanks for further growth. 2 The seed tanks are steel tanks designed to provide an ideal environment for growing microorganisms. They are filled with the all the things the specific microorganism would need to survive and thrive, including warm water and carbohydrate foods like lactose or glucose sugars. Additionally, they contain other necessary carbon sources, such as acetic acid, alcohols, or hydrocarbons, and nitrogen sources like ammonia salts. Growth factors like vitamins, amino acids, and minor nutrients round out the composition of the seed tank contents. The seed tanks are equipped with mixers, which keep the growth medium moving, and a pump to deliver sterilized, filtered air. After about 24-28 hours, the material in the seed tanks is transferred to the primary fermentation tanks. found in the seed tank and also provides an environment inducive to growth. Here the microorganisms are allowed to grow and multiply. During this process, they excrete large quantities of the desired antibiotic. The tanks are cooled to keep the temperature between 73-81° F (23-27.2 ° C). It is constantly agitated, and a continuous stream of sterilized air is pumped into it. For this reason, anti-foaming agents are periodically added. Since pH control is vital for optimal growth, acids or bases are added to the tank as necessary. 4 After three to five days, the maximum amount of antibiotic will have been produced and the isolation process can begin. 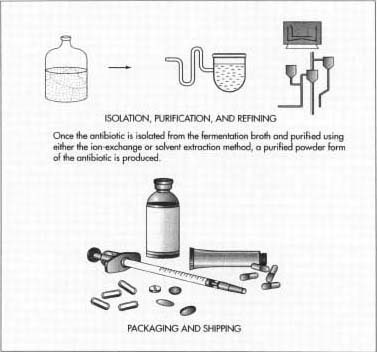 Depending on the specific antibiotic produced, the fermentation broth is processed by various purification methods. For example, for antibiotic compounds that are water soluble, an ion-exchange method may be used for purification. In this method, the compound is first separated from the waste organic materials in the broth and then sent through equipment, which separates the other water-soluble compounds from the desired one. To isolate an oil-soluble antibiotic such as penicillin, a solvent extraction method is used. In this method, the broth is treated with organic solvents such as butyl acetate or methyl isobutyl ketone, which can specifically dissolve the antibiotic. The dissolved antibiotic is then recovered using various organic chemical means. At the end of this step, the manufacturer is typically left with a purified powdered form of the antibiotic, which can be further refined into different product types. 5 Antibiotic products can take on many different forms. They can be sold in solutions for intravenous bags or syringes, in pill or gel capsule form, or they may be sold as powders, which are incorporated into topical ointments. Depending on the final form of the antibiotic, various refining steps may be taken after the initial isolation. For intravenous bags, the crystalline antibiotic can be dissolved in a solution, put in the bag, which is then hermetically sealed. For gel capsules, the powdered antibiotic is physically filled into the bottom half of a capsule then the top half is mechanically put in place. When used in topical ointments, the antibiotic is mixed into the ointment. 6 From this point, the antibiotic product is transported to the final packaging stations. Here, the products are stacked and put in boxes. They are loaded up on trucks and transported to various distributors, hospitals, and pharmacies. The entire process of fermentation, recovery, and processing can take anywhere from five to eight days. Quality control is of utmost importance in the production of antibiotics. Since it involves a fermentation process, steps must be taken to ensure that absolutely no contamination is introduced at any point during production. To this end, the medium and all of the processing equipment are thoroughly steam sterilized. During manufacturing, the quality of all the compounds is checked on a regular basis. Of particular importance are frequent checks of the condition of the microorganism culture during fermentation. These are accomplished using various chromatography techniques. Also, various physical and chemical properties of the finished product are checked such as pH, melting point, and moisture content. In the United States, antibiotic production is highly regulated by the Food and Drug Administration (FDA). Depending on the application and type of antibiotic, more or less testing must be completed. For example, the FDA requires that for certain antibiotics each batch must be checked by them for effectiveness and purity. Only after they have certified the batch can it be sold for general consumption. Since the development of a new drug is a costly proposition, pharmaceutical companies have done very little research in the last decade. However, an alarming development has spurred a revived interest in the development of new antibiotics. It turns out that some of the disease-causing bacteria have mutated and developed a resistance to many of the standard antibiotics. This could have grave consequences on the world's public health unless new antibiotics are discovered or improvements are made on the ones that are available. This challenging problem will be the focus of research for many years to come. Crueger, W. Biotechnology: A Textbook of Industrial Microbiology. Sunderland: Sinauer Associates, Inc., 1989. Morell, Virginia. "Antibiotic Resistance: Road of No Return." Science 278 (October 24, 1997): 575-576. Stinson, Stephen. "Drug Firms Restock Antibacterial Arsenal." Chemical & Engineering News (September 23,1996): 75-100. This artical provide much information . but side effect of this penicillin product is not described . These article has shaken some of my fundamental believes as far as drug processing entails.wonderful.